The Next Silicon Valley? Berlin Startups Catching Up With The Hype : All Tech Considered California's Silicon Valley remains the powerhouse of the high-tech startup scene, but investors and entrepreneurs in Berlin, along with London and Paris, are trying to catch up. Simon Fabich (center) is CEO and co-founder of the Berlin-based online shopping startup Monoqi. 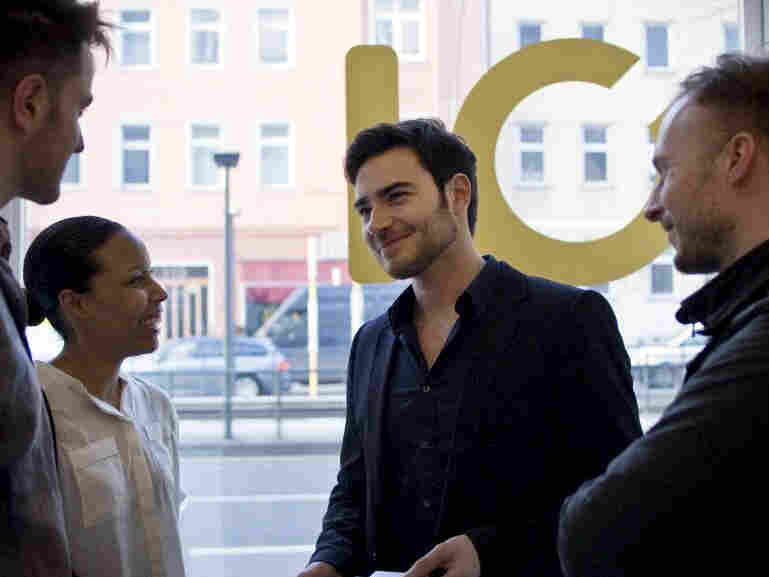 Artsy and relatively inexpensive, Berlin is an up-and-coming city for European tech startups. Sometimes it seems like the entrepreneurial spirit of young Berliners is confined to slacker hipsters selling used clothes to each other. But appearances can be deceiving. Berlin-based venture capitalist Ciaran O'Leary, a partner in the investment firm Early Bird, was grabbing a morning bite recently in the city's Mitte district when the barista asked if he'd like some crunched numbers with his espresso. It's this crazy green field ... There are a lot of creative people, and if you give creative people green fields, they build amazing things. "The guy making my coffee said, 'Hey, aren't you a [venture capitalist]?' And I said, 'Oh yes, I am, why?' And he said, 'Well, I've got this business plan I want to show you.' "
The barista then proceeded to hand it over. Maybe that's a sign the startup scene here is overheating. But O'Leary sees the incident as another affirmation of his decision to move Early Bird's headquarters to the German capital about a year ago. "It's this crazy green field. It's chaotic. There's a lot of creative people, and if you give creative people green fields, they build amazing things," O'Leary says. "Here, there's a constant dialogue. You run into people all the time. There's no escape. It offers a chance to build deeper relationships with entrepreneurs." O'Leary's office is near Sankt Oberholz, a cafe that's integral to Berlin's startup scene. It's packed daily. Inside, almost everyone is working intently on laptops, and mini-meetings are under way at many of the tables. Free high-speed Wi-Fi pumps through the cafe, along with occasional dance tracks over the speakers. You can't help but wonder who is really working on a startup plan, and who is merely an enthusiast, blogging about how cool that would be. But investor Ciaran O'Leary says the reality is starting to live up to the Berlin startup hype. "There has been a lot of hype. The young kid on the block needs to be loud, and Berlin has been very loud," O'Leary says. "But what's happening is this self-fulfilling prophecy. All around the world, everybody says this is one of the best places in the world to build a company. And then that actually happens." The audio-sharing Web service SoundCloud, which moved to Berlin from Stockholm several years ago, is thriving here. Some of the other winning Berlin startups include Wooga, Europe's largest developer of online social games, and the mobile advertising firm Madvertise. For its part, Early Bird has invested some $40 million in more than two dozen Berlin startups. The company also recently raised a new $200 million fund. O'Leary says Early Bird will probably spend about half that fund in Berlin. Not far from Sankt Oberholz, Alex Coggin, 27, shows me an old bank vault, safe-deposit boxes half-dangling from its big steel frame. A defunct, bright red "panic" button hangs on the wall nearby. The vault is now the conference room for startup Monoqi. Founded here just six months ago, Monoqi is an online shopping site that sells products by highly distinctive international designers. "As long as it's good design, there is a place for it at Monoqi," says Coggin, Monoqi's head of creative design. "I love bringing designers in because I think it paints a really good picture of who we are ... We're a startup. We're very unique. You can see that down to our office furnishings and kind of how we choose to present ourselves. You kinda know what you're getting into." Down the hall, Web designers crank their favorite work tunes in a former mortgage office. Coggin says talented, tech-savvy young people are drawn to Berlin, rather than London and Paris, because of the city's still relatively cheap cost of living, and for the hyped — yet somehow still iconoclastic — art and party scene. "Being Berlin-based does a lot of the legwork for us," Coggin says. When the company is scouting brands abroad, being able to say Monoqi is based in Berlin "helps a lot, because people know this is the place where trends are being set and ... where things are happening," he says. Berlin's city government, it seems, doesn't have a handle on what's happening in its own backyard. The city's definition of "startup" is meaninglessly broad, including hair salons and coffee shops. City officials can't say how many high-tech firms have opened up. But that may be a good thing. Members of the startup community here say the scene doesn't need city government help or meddling. But O'Leary does lament that the city currently lacks some of the intellectual infrastructure to build on Berlin's successes. "It is a real weakness of Berlin that we don't have a world-class engineering university," he says. "[And by] engineering I also mean code and software." Entrepreneurs also caution that Berlin still lags behind London, where there's been a 700 percent jump in technology companies starting up in its East End neighborhood in the past three years, according to the London mayor's promotional agency, London and Partners. Another challenge is money. Venture capital for startups in the U.S. fell 18 percent in the first quarter of this year, according to figures from Dow Jones. But in Europe, funding dropped 41 percent compared with the same period last year. Simon Fabich, Monoqi's CEO and co-founder, says Berlin still lacks a breakthrough digital company. "There has been no Google or Skype so far from Berlin," he says. Fabich, 29, bemoans the conservatism of the German business world, where some sectors remain risk averse. "The Americans are much more courageous when it comes to building something on their own. Sometimes courage is missing here to be independent," Fabich says. And as Early Bird's O'Leary puts it, "there should be 10 of us [venture capitalists] in Germany and three of us in Berlin — and there's just us." In German, venture capital is called "risk capital." And after World War II, the already conservative business culture got even more risk reluctant. The bursting of the dot-com bubble in the late 1990s didn't help, either. It will take five to seven years, O'Leary thinks, for people to cash out and become "angel" investors, and for Berlin's overall startup culture to mature and grow. "We are still miles away from something like [Silicon Valley]," O'Leary says. "Berlin will have its own strengths, and needs to work on its own entrepreneurial hub. It will never be the Valley, because the Valley has all these things Berlin will never have. "That doesn't mean it's a worse place to build a great company," he adds. "It just means it's a very different place." And for now, until more local startups succeed, cash out and reinvest in the scene, "different," "vibrant" and "fun" will likely remain Berlin's best startup selling points.